Anyone have the inside scoop on how arrow is getting away with free overnight shipping on all orders? Just curious. I have ordered a few small things from them - they are absolutely losing money on me. The rep is trying to pull me away from DigiKey though.....I am not a huge customer but enough to justify a few emails and phone calls I guess. The money lost on this is a marketing budget, but can't say it is working for me. I still use DigiKey based on ease of use and a very broad catalog. I rarely have to go searching for parts outside of Digikey. Arrow can get just about anything - but it may or may not be listed and may or may not be in stock. I just registered to share my 'mixed' Arrow free shipping experience (also applied 10% coupon code). In spite of having all parts in stock in their US warehouse (at Reno, NV) , they split my $11 test order (all smd parts) in 2 separate shipments and shipped on the same day. Fedex demanded $8 advancement fee on each of them, apart from duty/taxes. I have refused the second shipment (containing just a 3x4mm QFN chip) as it made zero economic sense to accept it (yes $8 is a big deal in India)! Even if you order a cut tape of 1/2 smd parts, you get the oversized packaging meant for full reel; e.g. 3 xp-e leds were sealed in a large MBB bag (proudly announcing seal date and class 1 moisture sensitivity) with silica gels and moisture indicator card inside. Got 6 page long delivery note and an MSDS. Apparently, the smallest shipping box they have is 10'x9'x4'. Their invoice can be cryptic for customs officials (although it contains HS code) and as a result, you may be overcharged. For example, they describe resistors as 'res', power managment ics as 'dc-dc conv' etc. I have a conspiracy theory that I was penalised (through split shipment) for making such a small order, which may or may not be true. Anyways, they have pretty good price for some cree leds. UPDATE: I also received a wrong part (smd resistor reading 320 while my order was for 210k). Too bad smd caps don't have any markings on them. Will definitely test them. Will definitely not recommend them for small order. Same split shipments to Canada here, means I will not order from them again, as each was charged $10 in fees. But I highly doubt it is penalization, if value is below $20 then there is no fee here for example. Its just a very poorly optimized operation. Arrow has finally agreed to refund me $6 after I accepted the 2nd shipment. (Fedex, however, did not entertain my request to waive off the surcharge at all). Contrary to misconception, the customer service was very prompt to reply to my mail. It's just the way their logistics work. I surmise that they're accustomed to working with large corporate orders, not little ones from individuals. I've ordered from them several times and my stuff is usually split into at least two shipments. Once, I ordered five items that were dispatched in three shipments all arriving at the same time. The shipments also tend to be overly packaged. An extreme example was when I received DIP IC sockets nicely arranged on anti-static foam that was mounted inside a pristine box as if it was precious. Amazing care for simple sockets. It does seem inefficient, but I guess it either works for them or the margins on their corporate orders is so great that the overhead of our purchases doesn't bother them. For me, what they really need to fix is their site/catalog search. It's really bad. But I can understand how split shipments are pretty irritating for international orders. Ordered four 4G x16 DDR3L chips from them. Today received an email that they only had two, and they said they gonna issue a refund for the rest. So either their stock management system leaves a lot to be desired, or something happened in the warehouse. But the price was too good to pass, so it will still be a good deal assuming I receive the shipment without issues. This morning I ordered two Busboard Prototype BB830 breadboards from Arrow. I used the 30% new account discount, but really the free shipping is just as important on a small order. Someone said they've been doing the free shipping since May. I hope it continues a while longer. By the way, for those interested, the BB830 regular price is only $5.91 at Arrow, vs $7.90 at Amazon,and even more elsewhere. I understand these are very good breadboards. I'll know soon. Just received my order of 10 DDR3L chips. These guys certainly spared no expenses on packaging! The shipment was from the Netherlands, order total was a bit over 100 CAD, I had to pay 16.33 CAD in taxes & fees. Yesterday I received another (earlier) order from them (2 DDR3L chips in industrial package), and they shipped them on a tray too. That order was like 25 CAD, and there were no taxes & fees. This just makes me not want to order stuff from them. Why contribute to this wasteful practice? For me, Arrow is best for larger orders, such as full reels of components or largish quantities of semiconductors. However, what seems like excess can make sense sometimes. 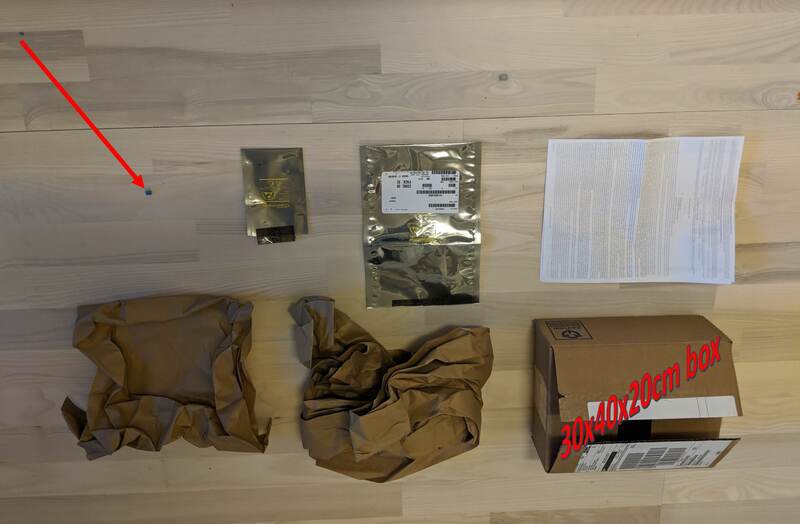 I ordered a small quantity (25) of op amps a while back (AD812ARZ), and they arrived in several bags, but each bag was a consistent datecode - they didn't just mix them all together. Many places like Mouser and Digikey don't mention the datecode at all, and I think Arrow is oriented to customers that need to keep track of datecodes and the like for traceability. So, I think Arrow is just trying to work their way down the sales chain to the small guys like us, and what seems excessive sometimes is not really excessive at all. If you think about it, being sloppy about mingling datecode lots is actually the sloppy practice. Sure, for little guys like us who don't have to do traceability, it seems extreme, but I can always trust what I get from them to be genuine and fully specified. Overall, I like Arrow and I like their promotions. I'll always check them for stock, and especially now with the giant vacuum for some parts like MLCCs, they can have useful stock that other vendors don't have. Overall, I'm a happy customer, and their free overnight is a great thing. I suspect it will only last until they get the sales figures they want. Arrow has always been a big name....with assembly houses (b2b). So, their practices for shipping are accustomed to that. That is why they ship in such a wasteful manner. They are trying to catch up to digikey and mouser (not sure what is going on with Newark) since they rule the b2c realm. As a result, they are probably using the free shipping as a loss leader to just get engineers and consumers to use it. Just in the past year, they have been spending A LOT on advertising to the Arduino/hacker crowd. At my previous company, they were literally giving us free samples of any demo board upon request. That is actually normal. It is because you ordered in a tray package instead of reel of tube (if they even have that for that part). I ordered 10 mega2560 chips once, but the PN was for the tray packaging. I got what you got. This huge tray that was only filled 10% of the way. Digikey is the easiest way to pay more for everything, Mouser beats Digikey in near everything, Arrow will not be a viable option until they fire's the marketing department who made that confuse and heavy website that is very hard to use. But for sure Digikey the worse option. Sometimes, due to shipping cost, Digi-Key can be cheaper. So, I generally shop all three to see what works out best for a particular BOM I need at the time. I didn't used to check Arrow, but I have been for the past year or so and ordered several times. So, their efforts are paying off. I always search parts at Digikey as it seem to have the best categorization, but for actually ordering parts the Mouser is my first choice (they recently opened an office in Canada few blocks away from my home ), if the part isn't there in stock, I check DK and only after it I look elsewhere. Too bad Mouser doesn't sell Xilinx FPGAs, so these I buy on DK. Few weeks ago Mouser started selling Micron parts (albeit at higher prices than elsewhere), but before that DK was my only source for everything memory-related. As for shipping - it's free at both DK and Mouser for 100 CAD+ orders, and whenever my order comes short of that, I tend to pad it with general purpose stuff like reels of 0402 resistors or caps as they are usually quite cheap, and you can never have too many different values. I always search parts and Digikey as it seem to have the best categorization, but for actually ordering parts the Mouser is my first choice (they recently opened an office in Canada few blocks away from my home ), if the part isn't there in stock, I check DK and only after it I look elsewhere. Too bad Mouser doesn't sell Xilinx FPGAs, so these I buy on DK. Few weeks ago Mouser started selling Micron parts (albeit at higher prices than elsewhere), but before that DK for my only source for everything memory-related. Good although its not a warehouse, so that doesn't really help with shipping right. They offer duty prepaid now, which is great. Arrow can learn from them at some point. But there is also a 6% premium over the US prices on mouser.com, in addition to the GST charged at checkout. Not sure what that would be, PST, or general markup? Do not know guys, Mouser never worked for me, it was every single time more expensive so i stopped looking at them. These days Arrow seem to be priced better for many things, if it does not have what i need i go to Digikey then. Also for bulk passives in 100's and 1000's Newark looks good. Whatever it is, Mouser still comes up cheaper than DK for me in most cases. DK charges HST just as well, so no difference as far as taxes go. One subtle advantage DK has is that it operates out of in-country warehouse, and so all parts already cleared customs. This is not a big deal in most cases, however if you would want to buy some "export-controlled" chips, buying these at Mouser can create a real headache, while DK shipments are all-domestic so no nasty surprises from customs (or some other gov't bureaucracy). Also for bulk passives in 100's and 1000's Newark looks good. I haven't actually ordered anything there yet, but since some time ago they began selling Xilinx stuff, I keep an eye on them as a potential second source of these parts should they become unavailable at DK for whatever reason. These days, Digikey ships much faster than Mouser, so I can often use less expensive shipping options if I need the parts somewhat soon. A few weeks ago, I placed an order with Digikey at 9:15PM on a Sunday night and it was fulfilled and ready for ship at 10:02PM that night. By comparison the same Mouser order, albeit with a 10x more SKUs, didn't ship 'til late Tuesday, adding an extra day to the process - it should have shipped Monday. So, while some of their prices are higher, you can often either save a day or two, or use a cheaper shipping option, so it's not always more expensive. I use Digikey, Mouser and Arrow, but the marginally higher prices at Digikey I find are more than offset by their fast fulfillment. YMMV. Digikey is very good at quickly shipping you exactly what you asked for in a single prompt shipment, even if it's just a bunch of 10-resistor 0603 cut tape bits, with free shipping for AUD$60 orders, and telling you exactly what they have in stock and what they don't before you order. It sounds like Arrow is struggling to match that user experience. I've started using Arrow more and more lately, why? *Mechanical parts are cheaper, scored some alps SKQEAAA010 and bourns pta slider for 50-70% cheaper than mouser. *Free shipping with no minimum order value, this is just amazing. Arrow's got the best overall pricing these days, and 10%-15% off coupons are routinely available. I find the parts I need on DigiKey but 95% of the time Arrow is cheaper, often by a lot! I even buy test equipment from them, since the coupons often make their deals unbeatable.